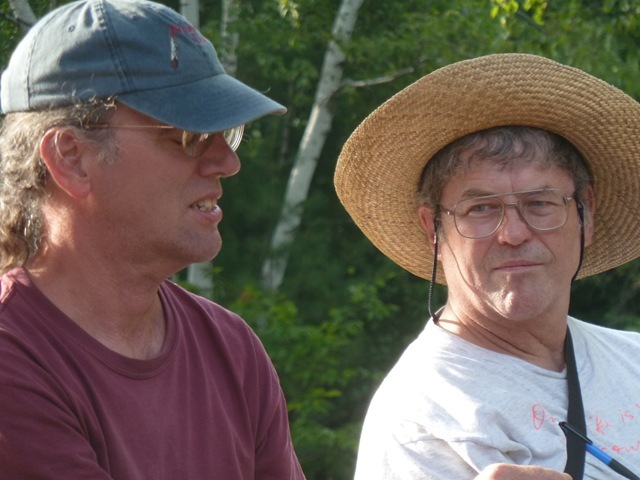 When I began a review of notes from my early years with AFSC, I already remembered many of the details of the New Hampshire peace movement in the early 1980s. 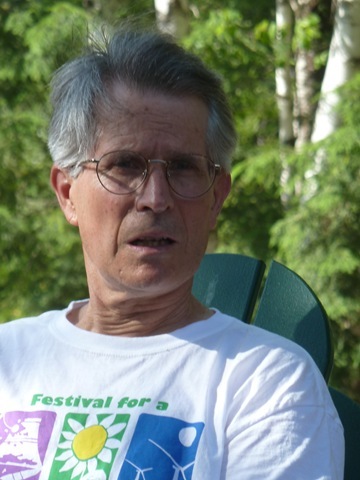 Following the lead of AFSC in Vermont, we coordinated the introduction of resolutions into dozens of Town Meetings in March of 1982 calling on the United States and Soviet Union to halt—or “freeze”–all further production, testing and deployment of nuclear warheads and the missiles and planes designed to deliver them to targets across the globe. The surprising success of the Town Meeting campaign, in communities which by and large voted Republican, caught the attention of national political leaders and changed the discourse over nuclear weapons at a time in which a popular president was leading a massive military build-up against a foe he termed “the evil empire.” Within three years, Ronald Reagan had shifted from a strategy based on waging and winning a nuclear war with the Soviet Union to one built around negotiations for nuclear limits. In 1985, Reagan and Mikhail Gorbachev came close to agreeing to the abolition of nuclear weapons. The basic story is clear in my memory. But there were a lot of details of the peace movement’s vibrancy which had slipped from my memory. For example, the month after Freeze resolutions were adopted in 48 of the 61 New Hampshire towns which considered them, my staff report mentioned plans for a “New Englanders for Peace” march in Portsmouth, with 1000 people expected. The following month, rather casually, my report said 2500 people marched from Pierce Island, across the Piscataqua River from the Portsmouth Naval Shipyard to Pease Air Force Base in Newington. Fourteen busloads went from New Hampshire to New York for the massive peace rally in Central Park in May 1982, timed to coincide with a Special Session on Disarmament at the United Nations. And as I contemplate our current situation, in which a president averse to diplomacy and enamored of nuclear weapons drives a mostly horrendous foreign policy with little public resistance and shifts the public treasury more and more to military programs, I have to wonder why we were able to mount an effective peace movement in the Reagan period and seem to be unable to do so now. I offer some thoughts on this and invite yours. Our president withdraws from the Iran nuclear deal even though Iran lived up to all its requirements. Instead he imposes deadly sanctions on Iran that will kill many as they did in Iraq under Bill Clinton. And he builds a dangerous alliance with Saudi Arabia and Israel specifically to confront Iran. A massive new war is not out of the question. Our president has announced he will withdraw from the INF nuclear treaty with Russia, the very treaty that ended the cold war in the late 1980s. Meanwhile Washington continues Obama’s trillion-dollar modernization of our nuclear arsenal. The Pentagon’s new nuclear posture review makes using nuclear weapons thinkable. NATO conducts military exercises near the Russian border after Russia has conducted its own massive military maneuvers. And the demonization of Russia by liberals and the Democrats rolls on. And tragically we see the growing glorification of the military as the only institution in the country that Americans feel proud of. 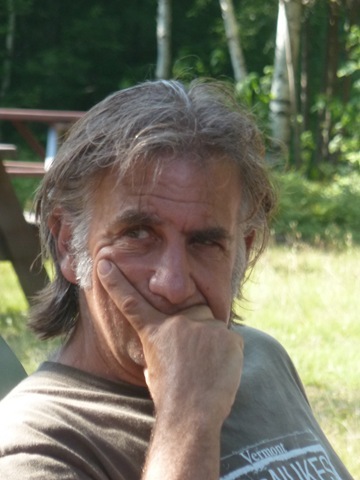 Paul says, “The peace movement is building itself up again to counter these dangers and offer alternatives.” I hope this is not just wishful thinking. It’s not that there is no activism. Consider the 2017 “Women’s March,” considered “the largest single-day protest in U.S. history” (although the largest assembly, in Washington, was still smaller than the 1982 disarmament rally in New York). Or consider the Families Belong Together rallies of 2018, when mobilizations took place in some 700 cities and towns to protest the cruelties of the Trump administration’s immigration enforcement practices. And yet, the anti-war movement is hard to detect amidst the “resistance” to Trumpist assaults on democracy and human rights. Opposition to militarism and ranks low on the progressive agenda. Presented with a resolution my own town passed earlier this year calling for a shift of public resources away from the military, my liberal Congresswoman said the issue ranks too low among her constituents’ concerns for it to matter. Imagine you are a high school junior, born in 2001. Your country has been at war in Afghanistan for your entire life, but you will rarely hear about it in what passes for the news. And while working class people continue to enlist in the military – perhaps out of a sense of patriotism, perhaps out of a need for gainful employment with benefits, perhaps for lack of other attractive options – you may not know there are people in your own community who oppose the war and want it to end. If you think about it at all, you might conclude that perpetual war is a normal state of being. It might be said that the urgency of other issues – racist police practices, institutionalized xenophobia, climate disruption, toxic masculinity come to mind – distracts attention from international events and U.S. foreign policy. But when I think back to the 1980s, I recall a period disturbingly similar to the present period, yet with a powerful peace movement. In a sense, Reagan can be seen as Trump’s closest political ancestor. Coming out of the world of entertainment, with little interest in policy details and an understanding of the world based on the plots of movies in which he starred, he was known as “the great communicator” for his ability to sway people with platitudes and a promise to return America to a (white) paradise that never was. Reagan’s domestic policy priorities were tax cuts, deregulation, and increased military spending at the expense of human welfare programs. Sound familiar? The people rose up. When the AIDS crisis emerged, gay activists protested the administration’s callous disregard for their lives and forced the pharmaceutical industry to produce affordable drugs. The anti-apartheid movement spread from city to city, state to state, and campus to campus, forcing governments to withdraw economic cooperation with the South African regime, aiding in its eventual collapse. Nearly half a million people joined the AFL-CIO sponsored Solidarity March in Washington after Reagan fired more than 11,000 striking air traffic controllers. A massive solidarity and anti-intervention movement grew up in response to the administration’s aggression against Nicaragua and its support for brutal right-wing regimes in El Salvador and Guatemala. People of faith flocked to the border between Nicaragua and Honduras to “witness for peace.” Churches offered sanctuary to immigrants who had fled violence only to be denied a lawful right to remain in the U.S. Activists developed a “pledge of resistance,” a plan for nationwide sit-ins at local Congressional offices in the event of a Nicaragua invasion. When the administration declared an economic embargo instead, “Pledge groups across the country planned and executed acts of civil disobedience across 80 cities in 16 states, with over 10,000 demonstrators and 2,000 arrestees,” according to the Global Nonviolence Data Base. Pledge of Resistance actions expanded to 42 states by 1985. The nuclear disarmament movement, which had been quiet since atmospheric testing was banned in the early 1960s, sprang back into life. With the 1979 “Call to Halt the Nuclear Arms Race,” the short paper by Randall Forsberg that outlined a demand for a US-USSR nuclear freeze, as a rallying point, the movement spread rapidly in response to the Reagan administration’s nuclear build-up, its doctrine calling for the USA to “prevail” in an all-out nuclear war, and the president’s inclination to see the US-Soviet conflict as a battle between good and evil. It wasn’t just the Freeze Campaign itself. There was Women’s Action for Nuclear Disarmament, inspired by Dr. Helen Caldicott’s apocalyptic warnings. Beyond War, a California-based group including ex-CIA officials, reached professional class audiences with the message that war was “obsolete” in the nuclear age. Physicians for Social Responsibility provided clinical warnings about the actual health implications of nuclear war. Bridges for Peace, Promoting Enduring Peace, and others promoted people-to-people exchanges with communities on the other side of “the iron curtain.” Ground Zero, founded by a former National Security Council staff member who didn’t even support the Freeze, ran educational programs on nuclear dangers alongside the rest of the movement. Within a rather short time, the movement grew large enough to affect pop culture. I remember the “Bloom County” comic strip making friendly fun of the New England town meetings with a character introducing a resolution to fill missile silos with pudding. “99 Luftballons,” a German pop song, became “99 Red Balloons,” a warning about the danger of accidental nuclear war in a hit English language version. The movement reached its biggest cultural impact with the 1983 release of a TV film, “The Day After,” depicting the aftermath of a nuclear war. According to my staff reports, I joined the publisher of the right-wing Union Leader newspaper and a few others for a live, post-film panel discussion afterward at the local ABC affiliate. By 1985, Reagan’s attitude had been adjusted. A new Soviet leader, determined to find a way out of endless conflict, made it possible for the US and USSR to get back on track for nuclear arms control if not on a path toward abolition. By the end of the decade, the Cold War was over, leaving too many people with the impression that the danger of nuclear war was in the past. But we had made a mark on history. Why were we able to build such a powerful movement? “These are revolutionary times,” Dr. King said. “All over the globe men are revolting against old systems of exploitation and oppression, and out of the wounds of a frail world, new systems of justice and equality are being born.” For growing numbers of participants in the anti-war movement, the United States wasn’t just wrong, it was on the wrong side. In other words, the war was not just built on lies, it was built on a deeply rooted and largely bi-partisan policy of aggressive imperialism. And with the ideology of the war system based in extreme anti-communism, the ideology of the peace movement was generally anti-anti-communist if not decidedly leftist. By the mid-70s, the peace movement was looking at the U.S. role in the Caribbean, in Central and South America, in South Africa and the “frontline states,” and in the oil-rich Middle East. That Reagan’s election came before such lessons had been forgotten made it easier to mobilize the public to oppose a reprise of Cold War militarism. 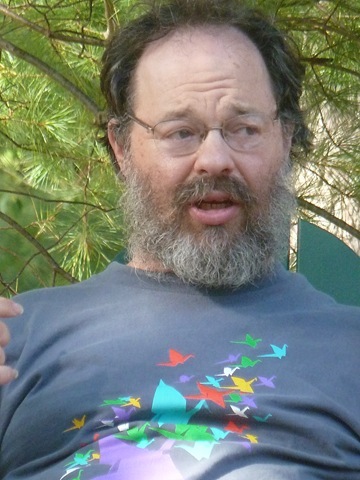 Another development was the rise of the movement against nuclear power, especially in New England where the Freeze movement would find its first active expressions. 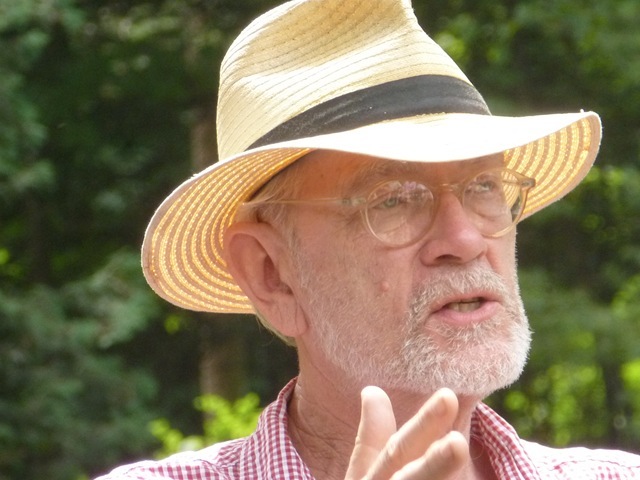 After years of largely ineffective anti-nuclear intervention by mainstream environmental groups, the shift to nonviolent direct action at nuclear construction sites in Montague, Massachusetts and Seabrook, New Hampshire gave mostly young “No Nukes” activists a chance to apply lessons learned from anti-war, civil rights, and feminist struggles of the previous period. The Clamshell Alliance, the network of locally based New England groups which led the Seabrook protests, was unhesitant about linking opposition to nuclear power and weapons. It was internationalist in orientation, actively seeking ties to the anti-apartheid movement and to groups challenging the pro-nuclear, anti-communist Marcos dictatorship in the Philippines. Although the Clamshell peaked in 1978, New England was still peppered with local No Nukes groups when Reagan was elected two years later. Not only did those groups provide fertile ground for a revived nuclear disarmament movement, they provided leaders with community and political organizing experience. 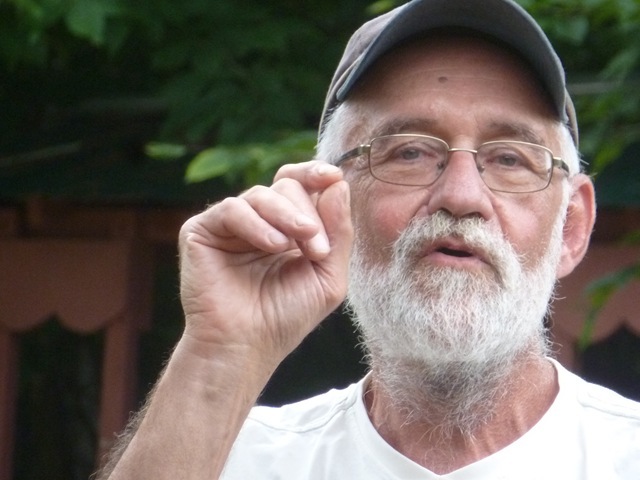 Here we might single out for special attention Randy Kehler, the Vietnam era war resister credited with inspiring Daniel Ellsberg to release the Pentagon Papers. 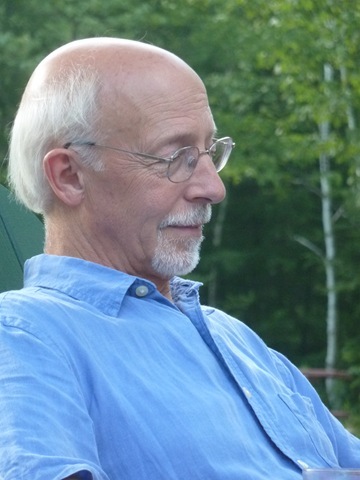 Kehler later settled in Franklin County, Massachusetts, where he was active in the local Alternative Energy Coalition opposing the Seabrook and Montague nukes. In 1980, he was the lead organizer of the referendum campaign that first put the nuclear freeze to a popular vote. Could it be that the intense anti-war sentiment aroused by George W. Bush’s war in Iraq has thoroughly dissipated? At the time, it seemed like anti-war sentiment was not based just on reaction to American body bags but to a fuller critique of U.S. policy in southwest Asia. Didn’t significant parts of the anti-war movement develop an analysis that probed deeper than W’s personal animus against Saddam Hussein and the orchestrated campaign of lies about weapons of mass destruction? Could it be that the trauma induced by the 9/11 terrorist attacks was so deep that the American public has been cowed into accepting anything done in the name of national security? That’s a tempting theory, but what, then, do we make of the massive movement that opposed the Iraq war? Recall the demonstrations in 150 U.S. cities and hundreds more across the globe on February 15, 2003, termed “the largest protest event in human history.” The NY Times equated the anti-war movement to a “superpower” rival of the U.S. and its military allies. Yes, the “baby boomers” who grew up under the shadow of The Bomb and who hid under their desks in civil defense drills were more sensitive to nuclear dangers than the millennials who grew up after the Cold War had ended. But where is the foreign policy agenda of the baby boomer progressives who make up such a large component of the anti-Trump resistance? Did the election of Barack Obama, who ran for president as an anti-war candidate and left office as droner-in-chief, cast a magic spell over the public? Can the fact that the massive nuclear build-up began with Obama’s approval account for the fact that Trump’s policy – largely an extension of his predecessor’s – make it immune from serious scrutiny? Were progressives that reluctant to criticize Obama that their critical capacities were wiped out? Which brings me to the relationship between progressives and the Democratic Party. Could it be that progressive activists find it harder to distance themselves from the Democrats than they did in earlier generations? The 1960s anti-war movement arose in resistance to a Democratic president with liberal tendencies on the domestic front. While the movement later found champions among Democratic Senators like McCarthy and McGovern, and some of its leaders (e.g. Tom Hayden) found their way into Democratic politics, it did not lose its ability to critique a bi-partisan foreign policy consensus rooted in Cold War ideology and the dictates of capitalism. That Hilary Clinton was a hawk offers little explanation, for foreign policy played little role in the 2016 campaign and her support was largely based on anti-Trump sentiments. What of Bernie Sanders, who led a serious (he called it a “political revolution,” after all) alternative approach that almost captured the Democratic Party? I recall one of his earliest campaign stops in Concord, New Hampshire, months before the first-in-the-nation presidential primary, when he was asked about the power of the military-industrial-complex. Acknowledging its unwarranted influence, Bernie was quick to shift to more comfortable territory. “The military-industrial-complex is enormously powerful, no question about it,” he said, adding “You have on Wall Street six financial institutions that have assets that are equivalent to sixty percent of the GDP of the United States. You have big energy companies who are unbelievably powerful. So, I think what you have is a ruling class in America.” Then he was back to the power of insurance and drug companies to block progress toward single-payer health care. Bernie’s campaign, consistent with his Congressional career, was built on economic issues: jobs, wages, health care, education. For Sanders (and much of the progressive wing of the Democratic Party), even international trade is considered primarily as a domestic issue. Despite Hilary’s reputation as a hawk, Bernie never tried to make an alternative to the bi-partisan national security consensus a significant component of his campaign. Could that be why his legions of followers have failed to do so as well? Two months before the 2018 election, Katrina Vanden Heuvel of The Nation wrote “the progressive left’s national security policy has been mostly missing in action.“ That opinion is hard to argue with, and there are plenty of good outlines for what such a policy would be. But without some clamor from below, we can’t expect an agenda to have much clout. Earlier this week, the town council in Durham, New Hampshire, approved a resolution calling for the abolition of nuclear weapons. 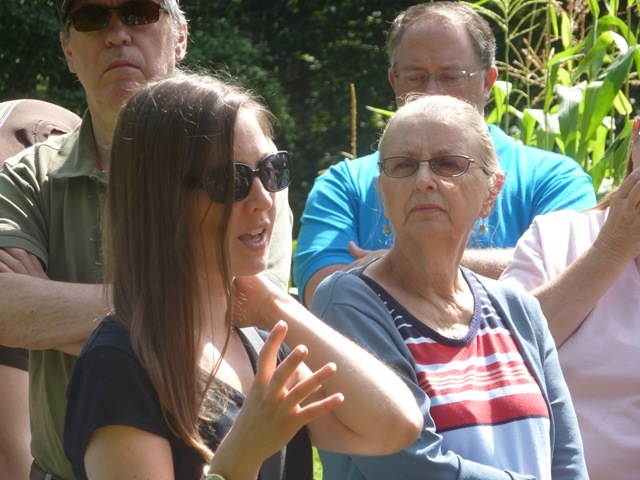 Seacoast Peace Response, a local group formed after the 9-11 attacks, is working with activists in other communities to bring similar resolutions before City Councils and Town Meetings in the coming months. With the 2020 New Hampshire Presidential Primary about 14 months away and the tide of possible presidential candidates visiting the Granite State starting to rise, the timing is excellent. Another ray of hope comes from the Poor People’s Campaign: a national call for moral revival. Following Dr. King’s lead, the campaign sees militarism, along with racism, poverty, and ecological devastation as inter-related pillars of an unjust system that needs radical change. As a new Congress takes office, this is a good time for a new peace movement to make its voice heard. Dr. Caldicott: Don’t let the Bastards Get Away with it! It was classic Caldicott in Concord last night at the NH Peace Action dinner: part biology lesson, part moral outrage, and part call to action. The long-term impact of the 1986 Chernobyl nuclear catastrophe, the longer-term impacts of the atomic bombings of Hiroshima and Nagasaki, and the still unfolding disaster at the Fukushima reactors in Japan have provided the Australian pediatrician with more than enough data to underline her call for nuclear plants to be shut down and nuclear weapons to be abolished. 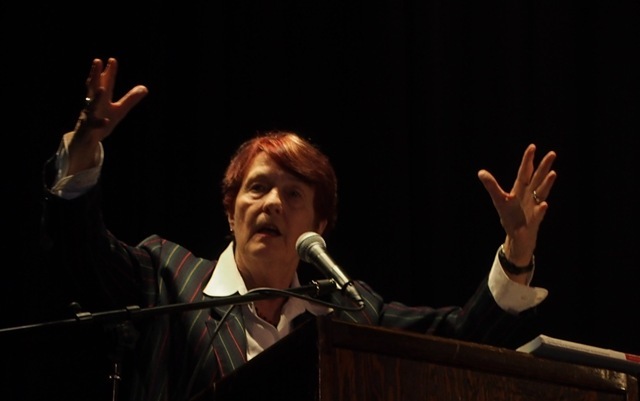 Part of the problem, Dr. Caldicott told the audience at Concord’s City Auditorium, is an “unholy alliance” between the World Health Organization and the International Atomic Energy Agency, whose purpose includes promoting nuclear power. And the IAEA still bases its health assessments on outdated analysis of the health impacts of the atomic bombings of Japan. Different types of cancer have varying incubation periods, she said, and even now people in Japan are getting sick from the use of nuclear weapons 68 years ago. Children in the Chernobyl vicinity are still being coming into the world with high rates of birth defects, she noted. Another problem, she charged, is that physicists, not doctors, still dominate the discussion of radiation effects. “I’ll be damned if I’m going to let those bastards get away with it,” she said, with passion in her voice and a twinkle in her eye. 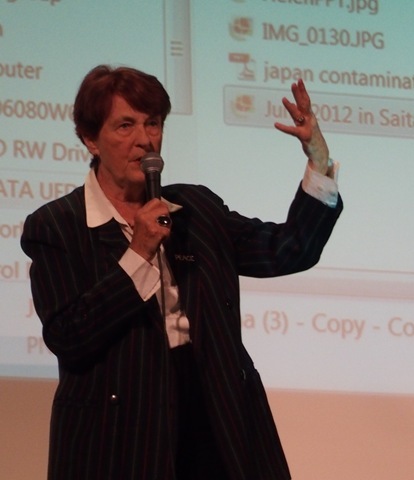 “Large areas of the world are becoming contaminated by long-lived nuclear elements secondary to catastrophic meltdowns: 40 percent of Europe from Chernobyl, and much of Japan” Dr. Caldicott wrote in a recent NY Times op-ed, reprinted on her web site. 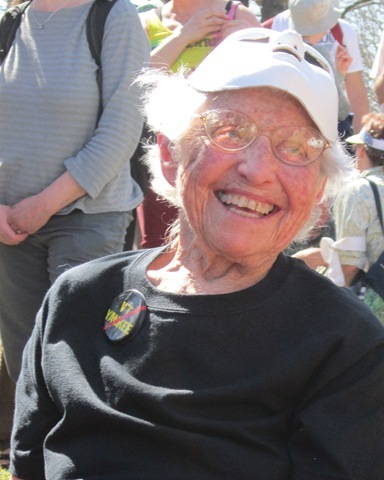 As a doctor treating children with leukemia in Boston in the 1970s, Dr. Caldicott was a key figure that animated the No Nukes movement in New England and then re-awakened the nuclear disarmament movement of the early 1980s. She served as President of Physicians for Social Responsibility, started the Women’s Party for Survival (which became Women’s Action for Nuclear Disarmament and lives on as Women’s Action for New Directions), and in 2001 formed the Nuclear Policy Research Institute, now known as Beyond Nuclear. Through books, films, and lectures like the one last night, she has reached millions across the world with an alarming analysis of the dangers we face from nuclear power and weapons. Alarm is an appropriate state to be in. 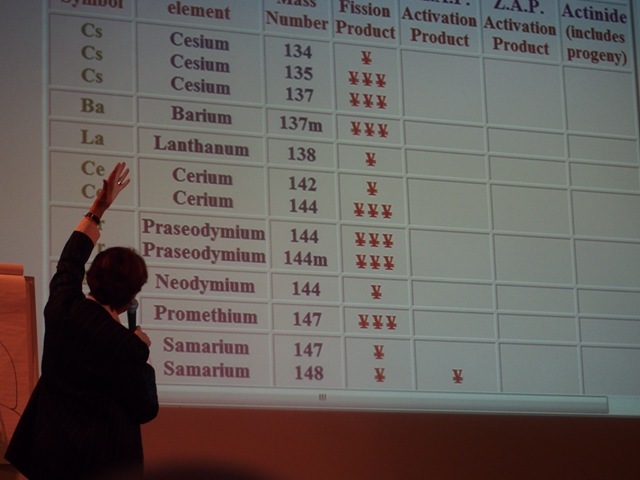 When Dr. Caldicott turned to her slide presentation, she began with a list of radioactive isotopes, then showed slides of birds and insects with genetic mutations associated with radiation spewed from Chernobyl 27 years ago. Dr. Caldicott wound up her presentation with a shorter warning about the dangers of nuclear weapons and the influence weapons builders have over US military policy. “Who runs the Pentagon?,” she asked. “Lockheed Martin,” she answered. Dr. Caldicott’s pleas would have been strengthened by references to efforts by Beyond Nuclear and SAPL to block a 20-year license extension for Seabrook Station and to the fact that Vermont Yankee (which she mentioned several times) is actually going to be closed after decades of No Nukes campaigning. 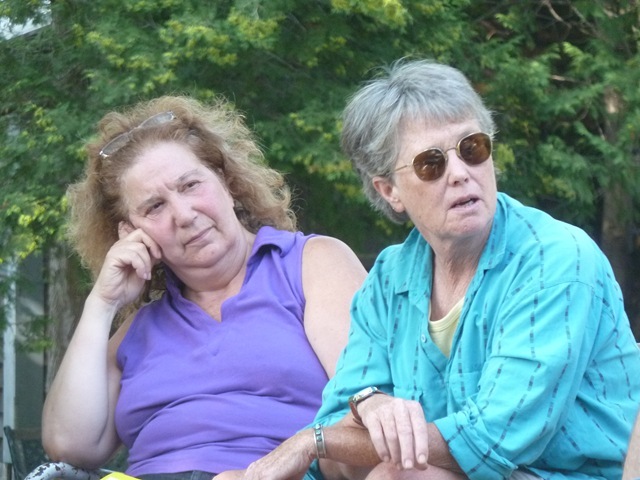 But at least she did follow Will Hopkins and Sandra Yarne, who talked about NH Peace Action’s current projects, including efforts to place “Move the Money” resolutions on New Hampshire Town Meeting warrants and city council agendas. One thing we’ve learned over the years: the best way to deal with the realistic dread that comes from living in the nuclear age is to work for a nuclear-free world. You can find out more about Dr. Helen Caldicott on her web site, http://www.helencaldicott.com/. 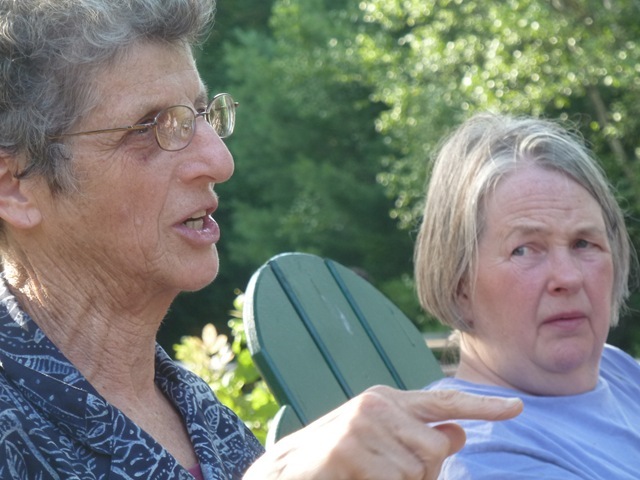 I was at the kitchen table stewing over a pro-nuclear op-ed in the Concord Monitor when Judy said it was time to leave for Beth and Ruth’s solar open house on the other side of town. Beth and Ruth have an impressive homestead with a big garden, a healthy looking flock of chickens, and two solar arrays on their rooftop. 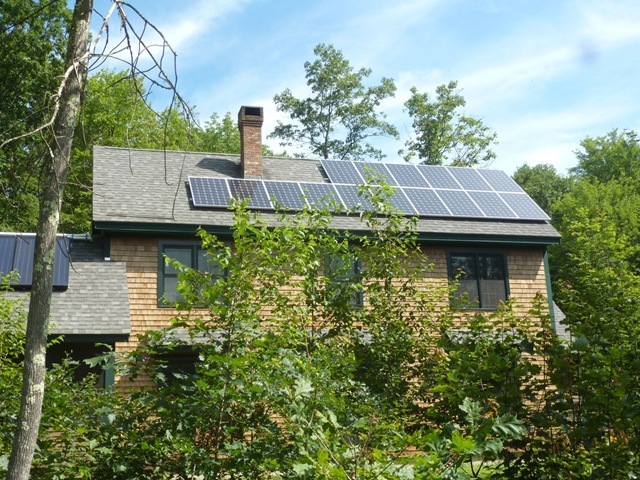 Yesterday’s open house was put on by the NH Sustainable Energy Association and ReVision Energy. ReVision’s ambition is to “transition away from fossil fuels and get solar on every rooftop,” said Heather Fournier, who explained how Beth and Ruth meet all their year-round hot water and electric power needs from the sun. 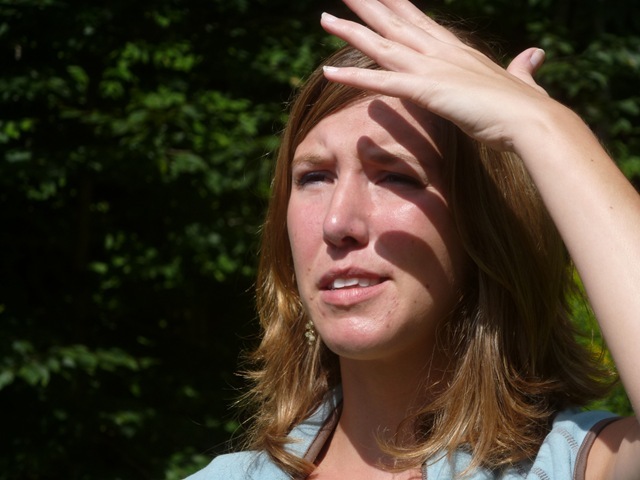 Kate Epsen, Executive Director for the Sustainable Energy Association, used to work at the Public Utilities Commission, where she became familiar with incentives for solar. Those include rebates from the state and tax credits from the Feds. There’s a few ways to hook up a solar electric system. You can go totally off-the- grid, like our friend Fred. But he needs batteries to store electricity and a generator for back-up. 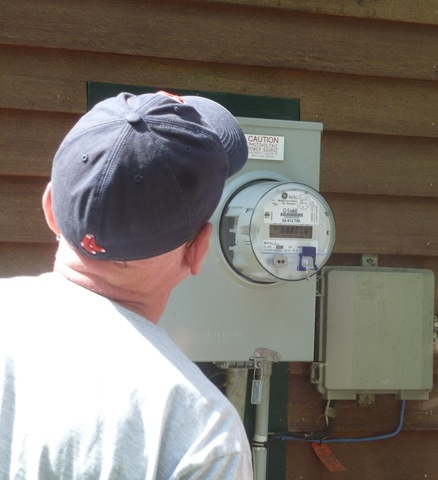 If you don’t want to go that route, you can hook up to your local utility, with a meter that runs in both directions. If you generate more than you use, you can either sell it back to the power company or use the grid, in effect, like a storage battery. That’s what Beth and Ruth do. ReVision is in business to design and install solar hot water and electric systems. Heather Fournier said they can also help consumers figure out the state and federal incentive systems. The Sustainable Energy Association, on the other hand, is an educational organization that also also pays close attention to public policy. Kate Epsen said this year the Association supported HB 306, a bill this year to develop a state energy strategy. The study will be under the direction of the NH Office of Ene rgy and Planning. Knowing that neighbors are getting most of their energy from the sun made it easier for me to return home and write a letter to the editor in response to the pro-nuke op-ed. 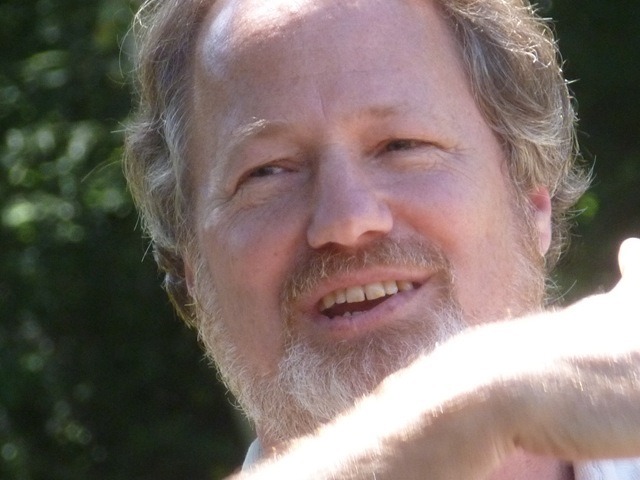 The column’s writer, who happens to be Concord’s mayor, has signed up as a member of a self-described “grassroots” group funded entirely by the nuclear industry and promoting nuclear power as the answer to problems associated with fossil fuels. But even if the nukesters had a solution for the waste problem (they don’t), and even if they could be trusted to keep reactors from spewing radiation (they can’t), nukes are not the way to deal with climate change. As my friend Paul Gunter of Beyond Nuclear said, they’ve gone from being perceived as “too cheap to meter” to being too expensive to matter. Meanwhile, solar is becoming increasingly competitive. That’s where the future lies. CLAMS OF THE WORLD UNITE! You Have Nothing to Lose but the Nukes, and a Solar Future to Gain! Stephen Comley addresses the Clams on the World Fellowship lawn. Ever heard of the “bathtub curve?” It’s a principle of reliability engineering that illustrates the failure rates for technology. When a form of technology is new, it has a high failure rate. As the bugs get worked out, failure rates decline. But as the product s age, failure rates rise again. 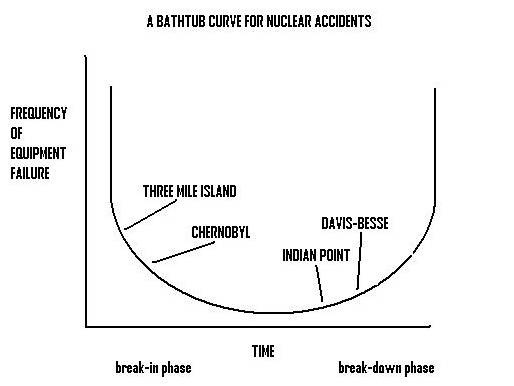 Paul Gunter says the bathtub curve is useful for understanding nuclear reactors. Disasters at Three Mile Island and Chernobyl represented catastrophic failures of relatively new reactors. Fukushima would be an example of failure for an aging reactor. The aging of the US reactor “fleet” means “this is the most dangerous time,” Gunter said. 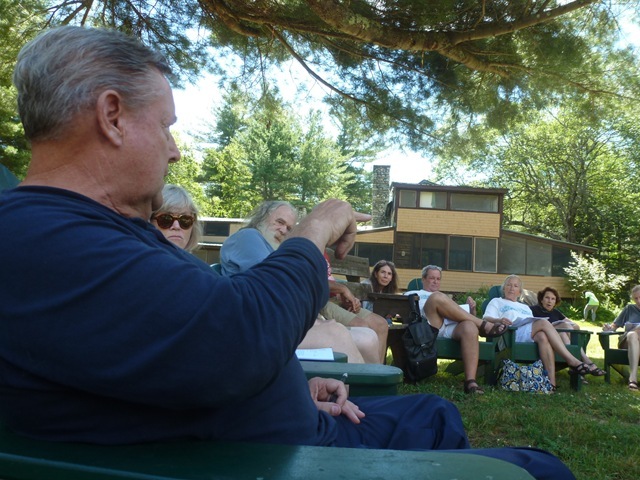 Gunter, a Clamshell founder who is now co-director of Beyond Nuclear, was one of several speakers at last weekend’s Clamshell Alliance Reunion, held at World Fellowship in New Hampshire’s White Mountains. The annual event is part social, part educational, part planning and plotting for a community of activists who met in the No Nukes days of the 1970s and 80s. Other speakers included Doug Bogen, who’s been promoting the potential of offshore windpower from floating turbines in the Gulf of Maine; Naoto Inoue, a solar entrepreneur from Arundel, Maine; and Stephen Comley, who woke up to the dangers of nuclear power when an NRC official told him to stock upon potassium iodide pills for the the residents of his Rowley, MA nursing home, 12 miles from the Seabrook reactor. Spurred to action, Comley organized 80% of town residents to sign a petition for Seabrook to be shut down. As a long-time Republican activist, he even delivered the petitions in person to President Ronald Reagan. He is still talking about nuclear dangers, especially his allegation that counterfeit, substandard parts were installed at 72 reactors, a fact revealed to him years ago by an industry insider. 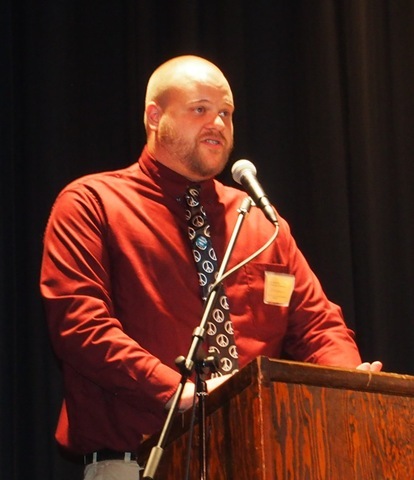 Comley started a group, “We the People,” to collect such stories and try to get action from people in high places. At this time he’s trying to communicate with Michelle Obama in hopes that she can get through to her husband. 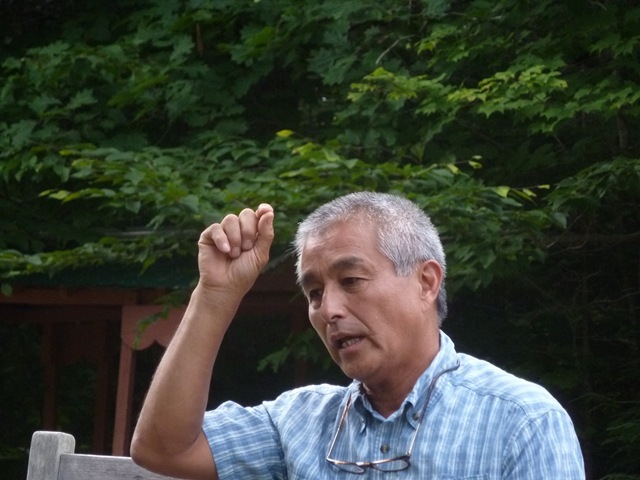 Paul Gunter said “climate change needs to motivate all of us.” That’s why it was great to hear from Naoto Inoue, who heads Talmage Solar Engineering in Arundel, Maine. From installing photovoltaic (PV) systems at homes on the coast of Maine, Inoue has taken the plunge into large-scale solar generation with a 2.2 megawatt PV installation in Sharon, Vermont. With support from Vermont’s pilot “feed-in tariff” program, the solar array can economically provide enough electricity for the entire town. Doug Bogen says offshore wind is another viable alternative. The state of Maine has a commitm ent to support 5000 megawatts of capacity in the next 20 years, by coincidence the date the Seabrook reactor’s license is due to expire. We can’t rely on wind for 100% of our energy needs, he said, but the potential is there to replace New England’s aging nuclear plants and phase out fossil fuel plants as well. Bogen is promoting the idea that the Portsmouth Naval Shipyard, a massive industrial facility sited on a deep water port, would be the perfect place for the massive wind turbines to be manufactured. One difference between a person and a corporation is that a corporate person can be in many places at once. To occupy space in, say, three states, it takes at least three natural persons. There were many times that protesting today outside the offices of Entergy Corporation, the rogue corporation that operates the Vermont Yankee nuclear station in Vernon, Vermont. Had the plant’s operators been obeying state law, the plant would have ceased operation today. Upwards of 1000 people took that message to the company’s Brattleboro office this afternoon. More than 100 of them were arrested and charged with unlawful trespass for attempting to deliver their message directly to the company. Meanwhile, seven activists with roots in the New England anti-nuclear movement were arrested for criminal trespass inside Entergy’s corporate headquarters in New Orleans. They were Renny Cushing, Lynn Chong, Ben Chichester, Kendra Ulrich, Jeff Brummer, Nelia Sargent, and Paul Gunter. They were released after six hours. Five others were arrested at Energy’s office in White Plains, NY, near the aging Indian Point reactor. 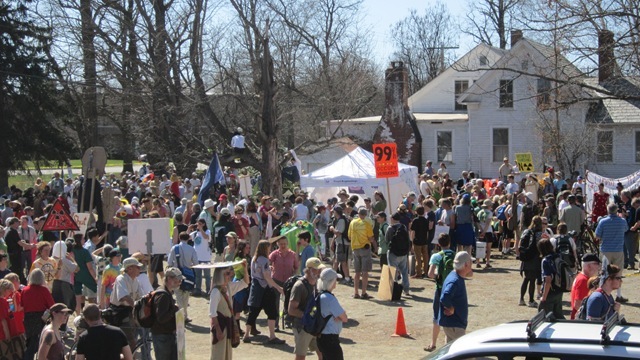 The demonstration outside the Entergy Brattleboro office, organized by the SAGE Alliance, followed a rally on the Brattleboro Common and a 3.5 mile march up Putney Road and Old Ferry Road . Organizers made a deliberate decision to demonstrate there, rather than at the reactor, to keep the attention on the Entergy Corporation. “We come peacefully to Entergy Headquarters today with this message: your time is up,” began the SAGE Alliance’s statement about the demonstration. 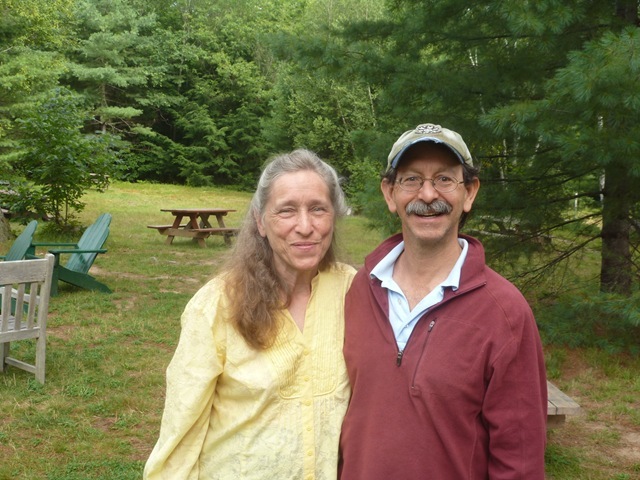 Spirits were high throughout the Brattleboro action, and the potential of solar energy was much in evidence. Entergy’s 40-year license expired yesterday. Although it received a 20-year extension (the day after the Fukushima meltdown began) from the Nuclear Regulatory Commission, the State of Vermont insists the New Orleans corporation also needs a Certificate of Public Good from the state and permission of the legislature in order to keep operating. The dispute is ongoing in federal court. The day’s actions represent the beginning of a new phase of resistance to VT Yankee and defense of democracy. Visit the SAGE Alliance web page for information about upcoming actions. Speaking of Vermont Yankee and Seabrook, where disaster is always a few unforeseen events away, the Japanese government is about to declare a permanent evacuation of the area near the melted Fukushima reactors. As the sign says, better active today than radioactive tomorrow. The announced plans by Entergy, the owner of the decrepit Vermont Yankee nuclear plant, to reload the reactor this fall with $60 million worth of fresh nuclear fuel is sure to set off a showdown with local activists determined that the plant’s life should end when its license expires next March. The company has already received a 20-year license extension from federal regulators, but the state of Vermont insists continued operation cannot go forward without state authority. And given the radiation and lies that have spewed from the reactor for years, the state is determined to see the plant shut down. The New Orleans-based company’s announcement comes a week after a federal judge turned down its bid for an injunction to push aside the state’s objections, meaning a trial will go forward in mid-September to test the company’s claim that federal law pre-empts any state authority. The case is likely to end up in the US Supreme Court. Given a history of court and regulatory deference to nuclear plant operators going back decades, activists are not putting their faith in federal judges. That’s why the annual Clamshell Alliance Reunion last weekend spent most of its time discussing education and action to make sure the will of the people is respected and the plant shuts down on schedule. 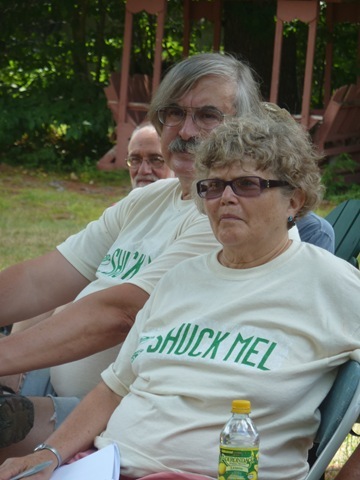 The Clamshell Alliance is known for leadership of small and massive nonviolent demonstrations against construction of the Seabrook nuclear plant and for creative grassroots public education throughout New England. In its heyday in the late ‘70s, dozens of Clamshell affiliated groups were active throughout the northeast. 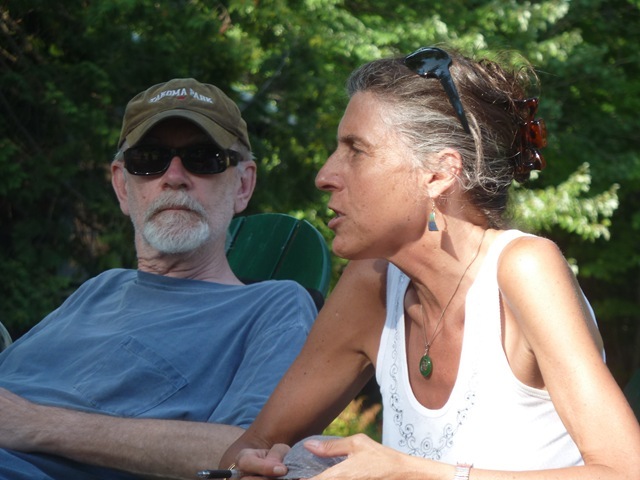 With the 35th anniversary of the first Clamshell civil disobedience coming up Aug. 1, the Alliance continues its life through lifetime friendships and social networking that crosses over from No Nukes activism into feminist, labor, peace, anti-death penalty, and other movements. 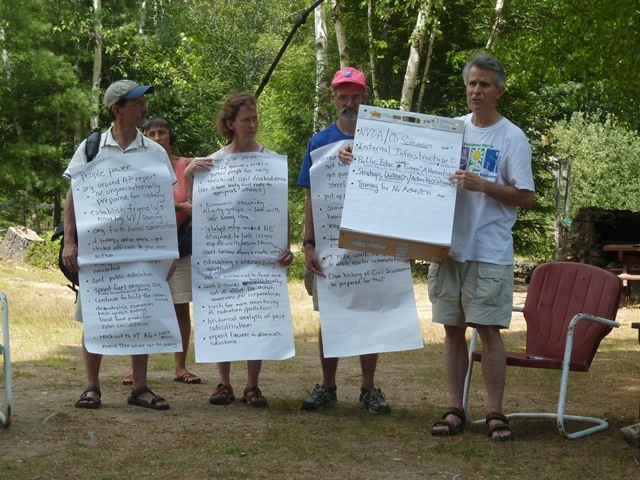 With background from leaders of groups such as Beyond Nuclear, Safe & Green, and the Seacoast Anti-Pollution League, and more than a thousand person-years of anti-nuclear experience among them, the Clams didn’t waste time arguing about the dangers of radioactive poisons or the extent to which “corporate subversion of democracy” has poisoned our political system as well. Nor did they need to argue about the power of active nonviolence, especially given the uprisings taking place around the world. Instead, time was spent discussing how to use “Into Eternity,” a film about nuclear waste, to arouse public opinion; plans for a tour of German environmentalists to spread the word about how that country plans to shut down its nukes and generate enough electricity from safe alternative sources; and how to make sure old and new activist networks are taking advantage of social media to communicate with each other. Discussion turned of course to plans for nonviolent direct action and civil disobedience, though no specific scenarios have yet been developed. But it’s reasonable to assume that if Entergy insists of flouting the will of the people of Vermont, nonviolence training programs and formation of affinity groups will start up soon.